With its vast expertise in document and IT management, Ricoh can offer you a variety of services to help you be more efficient at work. Ricoh Managed Print Services (MPS) encompass the three fundamental elements of document management: capture (the creation of information), transform (how information moves around a business) and manage (processing information in a way to add business value). Before deploying MPS, we study how your business accesses, uses and stores both print and electronic information. By looking at your devices and printed information, we work to optimize that infrastructure to make sure your employees have the right support to do their jobs effectively. We then look at user input and output behavior (what they print and why). We apply printing management technologies to maximize productivity, eliminate waste and costs, and govern the information. Then, with a careful eye on information security issues, we adapt and optimize those processes to make them more efficient and effective—and help you manage that change more effectively. Ricoh works with you every step of the way and adapts our recommendations to your business model to create a journey of continuous improvement. Whether it's print or digital, Ricoh Managed Print Services are all about moving information freely throughout your entire organization. When you've made information available, adaptable, searchable, intelligible, portable, and reusable, you have enhanced your ability to satisfy employees and customers, preempt competitors and run your business more profitably. Ricoh carefully controls the costs of your new and improved business processes. We also prepare your employees to deal with the specific changes they're experiencing. We align our skills, technology, and experience with the ways people prefer to work – accelerating performance and productivity, and enabling you to adapt quickly to a changing business environment. Ricoh IT Services are designed to keep your business operations online, running and always available for your customers—as well as maximizing the productivity of your employees, partners and suppliers. Of course, we provide an integrated comprehensive menu of IT services and solutions, and provide you with the latest hardware and software, including client PC, servers, network equipment, tablets, operating systems and anti-virus tools. But more importantly, we'll work with you directly to design, build and optimize a unique IT infrastructure that fulfills your particular business needs. And we'll help you manage it all through remote or on-site support. Ricoh has got the basics covered. We can monitor your infrastructure to ensure that your employees have the tools they need to work as productively as possible. We can assume responsibility for some of the fundamental security measures to keep your business running smoothly: regularly updating and patching software, making regular backups and keeping on top of user authentication, access control and training. To boost organizational efficiency, we partner with your IT staff to work with Line of Business managers to find the best solutions to streamline business processes, making them more efficient and less costly. The result? You maintain your competitive edge with your IT staff able to focus on more strategic business issues. Through a unique delivery model that is more flexible than traditional Business Process Outsourcing (BPO), Ricoh Application Services/Business Process Services (AS/BPS) begin by helping you evaluate the way that information flows within your business. Then, we help you redesign, implement and manage an enhanced set of business processes, creating the best possible fit between business applications, innovative technologies and the processes they are designed to enable. By tailoring these processes to your unique needs, we aim to help you to increase infrastructure agility and employee productivity, enhance customer relationships and interactions, and reduce business cost and risk. Ricoh AS/BPS can help you control costs by utilizing our expansive global delivery network. Between our applications, cloud or on-premises solutions and on- or offsite process management, your business can save some serious cash. And by providing accurate, timely and complete performance metrics on demand, Ricoh can give you the information you need, when you need it, to make the critical business decisions that help you grow your business. Our services cover every aspect from start to finish: consulting, customization, implementation, support and maintenance. With Ricoh AS/BPS, you will have the right solutions and processes in place so you can better focus on your core business activities. Effective communication is essential for business success. Your employees must be able to connect and collaborate quickly and effectively with customers to maintain your competitive advantage. Ricoh's Communication Services offer tailored collaboration solutions to help you seamlessly facilitate dialogue between your employees, partners, and customers. Whether you're looking for real-time information sharing, a virtual help desk, professional conferencing facilities or targeted digital signage, we can design, deliver and support the tools you need to do better business. 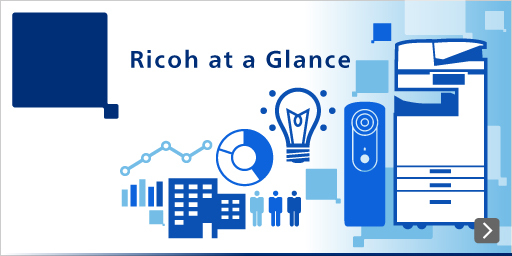 If you want to boost productivity and work smarter, RICOH Intelligent Workplace Services can help you.